Soft, subtle, detailed and startingly lifelike are the first words that spring to mind when looking at Alex Louisa’s paintings. 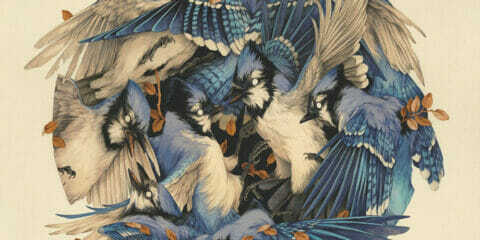 Muted and deep backgrounds contrast richly with pops of colour and exquisitely-detailed birds, butterflies and cicadas. Each painting captures the enthusiasm Alex feels when finding lost objects, or when she sees that perfectly curled leaf about to flutter off a branch and onto the ground below. Combining these elements, she creates visuals that let us discover these little things for ourselves. Like many other painters, Alex’s journey to becoming one was a winding road. She went to school for Journalism and Creative Writing based on the advice given to her to have a backup plan, as it was difficult to make a living as an artist. After getting this degree, she worked as a graphic artist, which she credits with giving her the experience and knowledge behind which colours work best together. Also, like many other painters, the calling to create wouldn’t be ignored. 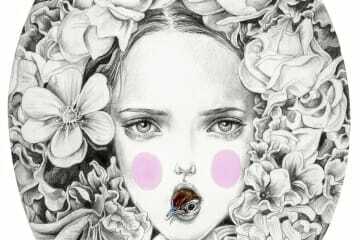 Initially working with coloured pencils, she eventually gravitated towards painting, oil painting specifically, and then to PanPastels and charcoal pencils. Alex’s first word as a child was “bird” and it’s a creature that continues to hold fascination for her. This is evident as many of her subjects are birds, bird skulls, feathers and other winged creatures like butterflies and cicadas. She finds inspiration everywhere: pulling a palette from “a couple of book covers stacked on top of each other,” she is drawn towards colour combinations and textures. By visiting bird sanctuaries, she learns about specific postures the birds take, “how it tilts its head or its eyes light up when it’s focused on something,” and she surrounds herself with nature by keeping multiple plants in her studio. As she attempts to capture the wild, Alex’s artistic style is beginning to go through a metamorphosis that holds its own wildness. This challenge is one she is up for, and she’s determined to create more series in the future. Keep an eye out for updates on Alex Louisa’s work and future exhibitions.